Woo, woo, woo, woo!That is my message to all of you out there who supported the Republicans this last election and thought they would make a material change to reduce the federal deficit. You’re never gonna get it! All references to 90’s R&B groups aside, let’s take a serious look at this. We are about ready to have a showdown on the debt ceiling. As of yesterday, January 6, 2010, the federal debt subject to the debt ceiling was just shy of $14T. The current ceiling is $14.294T and we will reach that figure sometime between March and May this year. The date cannot be exactly determined because day-to-day receipts and expenditures are not fixed – just like your own budget. (See this entry from 2009 to get a little more detail on short-term Treasury securities.) But, the showdown is coming; there is no doubt about that. Now, many fiscal conservatives want to see material cuts in the budget. I’d also venture to guess your average Tea Party Republican is squarely opposed to raising the debt ceiling. These GOP supporters are going to be very disappointed when their House leadership (not to mention, and I’m guessing here, all but a handful of GOP Senators) votes to raise the debt ceiling. It is inevitable and what we’ll hear is a bunch of lip service that they’ve made some sort of grand compromise to get us on the right track. But, let’s face it. All it will be is lip service. Let’s take a look at the budget and a realistic scenario of what we might expect the GOP to offer as well as a theoretical balanced budget provided by yours truly. To start, we take a look at a summary of the budget. We all know that budget deficits have exploded beginning in fiscal year 2009. It should be noted that this is a George W. Bush budget and not an Obama budget. Next, we look at the growth of the total public debt and that which is subject to the debt ceiling. It is clear that we will reach the current ceiling soon. On a basic trendline forecast, it will happen in March. So, what actually makes up the federal budget from an expenditure point of view? 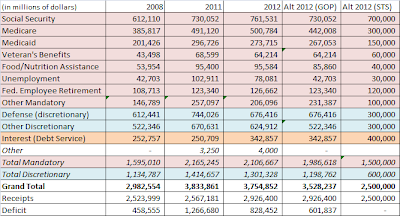 The next table details the key categories and shows the actual figures from 2004 (fiscal year) through the current projection for 2013 based on Obama’s 2011 budget. You can see the details of the explosive growth and also note the key expense categories: Social Security, Defense, Medicare, Interest on Debt, and Medicaid. Those five categories typically make up two-thirds of the federal budget. This scenario would lead to a $3.5T budget. If there are no changes in total federal revenues (i.e. no tax increases or significant growth in GDP), this would still leave a budget deficit of over $500B. In fact, it would only reduce the deficit by 29% which means the debt ceiling would need to be raised by over one trillion dollars from its existing level to get us to October 30, 2012 (right before the elections). Think about that. Even if the GOP brings its “A” game, I think it’s hard to imagine a scenario where they do not have to vote to raise the debt ceiling by over (I’ll say it again) one trillion dollars even before we reach the lame duck session of 2012. Hey Tea Party folks… I think it’s time you take a look at the Libertarian Party. For those of you who are not Tea Partiers… please recognize the current path is unsustainable. We need to dramatically cut the size and scope of the federal government. You should also be looking at the LP!